Van der Burgh and Calamus scored a 64.595% in the USEF First Level Test 2 class. “I have had him in training for about six months and this was his first time to compete at First Level. Several people asked me if he was a stallion because he was so calm during the show that they weren’t sure,” van der Burgh said. A well-respected name in the equine world, van der Burgh spent many years working with world-class trainers in his country after graduating from the demanding Dutch Professional Equestrian Training program in The Netherlands. In 2006 he founded his own training, teaching and sales business in South Florida, where in addition to training horses from lower levels through Grand Prix he provides lessons and clinics to everyone from beginners to experts. “I really enjoy training and I will have to say I am a big fan of the Lusitano breed. They really are nice horses and excellent for amateurs,” he said. Cecilia Gonzaga, the Managing Director of Interagro Lusitanos of Brazil, was thrilled to hear that one of Interagro’s own horses won the Lusitano High Score Award. “We are always excited to recognize the outstanding achievements of a Lusitano and it is even more exciting when it is a horse we bred. Calamus Interagro is a gorgeous bay stallion that I knew would have great success in the show ring. He is a lovely combination of the best qualities of his amazing father, Tufao Interagro, who died in 2010. Tufao Interagro left behind 71 extraordinary sons and daughters and I am excited to hear that Calamus is carrying on the success of his sire,” Gonzaga said. 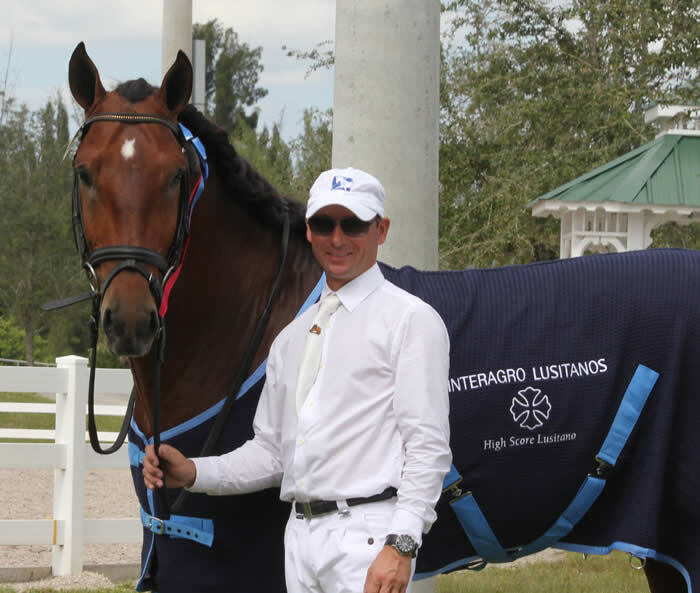 Gonzaga said that Interagro’s intent over the years has been to develop a bloodline of Lusitanos that are competitive in contemporary equestrian pursuits, including FEI level dressage. “For riders who aren’t familiar with the Lusitano breed, we invite you to visit us in Brazil. Once you have been to our farm and experienced the Lusitano, you will be forever changed. When you visit our farm, you become part of our family and will experience Interagro in a unique way: from riding and driving the horses, learning the history of the farm, experiencing the Brazilian culture and food and appreciating the warmth and dedication that our family has for our horses, home and country,” she said. To learn more about Interagro Lusitanos, or a buying trip to the Brazilian farm, visit their website at www.lusitano-interagro.com. Founded in 1975 by Dr. Paulo Gavião Gonzaga to preserve the Lusitano breed, Interagro Lusitanos is now recognized as the world’s largest breeder and exporter of Lusitano horses. Dr. Gonzaga started with a small band of four mares and one stallion imported to Brazil from the breed’s native Portugal; to date nearly 700 horses populate the 1200-acre ranch outside São Paulo. Today, Cecilia Gonzaga manages the farm and operations. Interagro Lusitanos are handled, prepared, and evaluated from birth, with a handful of the best stock presented at auction each year.